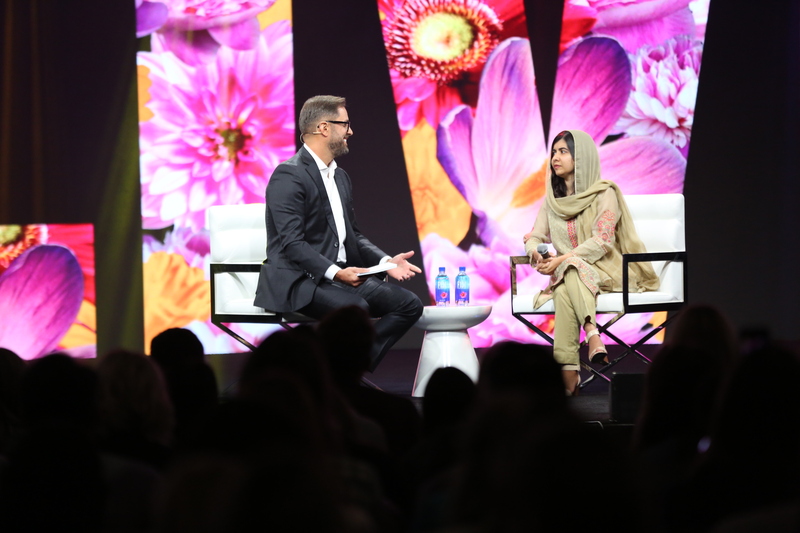 There was great anticipation and excitement ahead of Malala’s appearance at the PluralsightLIVE conference in Utah. She came on stage to a standing ovation and rapturous applause from everyone in the room. My first impressions of Malala were that she was smaller than I had expected and although was confident she also appeared very humble. During her conversation with Aaron Skonnard, CEO Pluralsight Inc. she spoke about how she was influenced by her father Ziauddin Yousafzai, who is an education activist and teacher who ran a girl’s school in Pakistan. She spoke about how he dealt with his own particular life challenges and how she learnt from him. Even at a young age Malala had the foresight, courage, determination and wisdom to see that she wanted to live a different life from the other girls in her village. It was touching to hear her story about her friend who had disappeared for a while. She later found out that her friend had gotten married at 14 years of age and had a child, even though she was a child herself. Malala realised that education was the key to her future. She knew from an early age that this was being taken away from her by men who had guns and who stopped girls from going to school. This was not acceptable to Malala. Having no fear and believing that all girls should have the right to education she spoke out about it publicly. This made her a target of the gun men. The rest of this story is history as she was shot and airlifted out of Pakistan to a hospital in the UK. Malala is a fighter, a crusader for justice and her inspirational story doesn’t stop there. When she was recovering from her injury she made a decision that she could either live a quiet life or make the most of her second chance. She decided on the latter and set up the Malala Fund with her father. This fund is a charity to help girls choose the future they want. She wants women to feel empowered. To know that they are equal even though some of them are not even aware of this. It’s a timely reminder for every woman not to become complacent about how fortunate we are to have so many educational and other opportunities available to us. Malala transported us back to when she was a child and believed in magic. She wanted her pencil to be magic and she laughed as she explained that it didn’t work out. She said she discovered her voice was her magic which was very touching to hear. She urged us all to find our magic and to encourage children to do this too. To let them know that they can change the world. She also believes that technology is magic. Aaron Skonnard told her that she is magic, and everyone agreed. Appreciate and celebrate what we have in common. Wrapping up the interview Aaron Skonnard ask Malala about her ten year plan. She told him that she is currently studying Philosophy, Politics and Economics at the University of Oxford, and is ‘kinda living away from home’. With her quick wit she asked him if she could work for Pluralsight when she finishes college. He smiled and said that he would work something out. Malala is very much grounded in reality. Her experiences of life and people in her village in Pakistan at a young age shaped her. Her inspirational story touches and helps everyone she encounters. It’s no surprise that at 21 years of age she is the youngest Nobel Peace Prize laureate. Her presence, wit, and story touched everyone in the room and left them inspired. Long may her magic continue?